Posted on December 15, 2013 at 4:18 pm. Collaboration is something all creative professionals should try. I can’t place enough importance on flexing some creative muscle to keep your skills sharp, but it’s SO HARD to get anything done outside of your day-to-day work with deadlines and meetings…and deadlines. Corralling 3 designers to hit a (non-essential) deadline right after the holiday season? Just like herding cats. The good news? They all came through like I knew they would and we ended up with a beautiful product from a talented group. A friend of mine, Bob Case, had created a beautiful iconic (scratchboard style) illustration for the local Addy awards a few years ago. I enjoy the iconography of religious art so much, and knew his style would play well on the antique letterpress. Skulls and symbolism are something I enjoy incorporating into my own illustration, so the only thing left was to enlist the help of a few talented friends (Tim Brennan and Kristy Roehrs) to seal the deal. 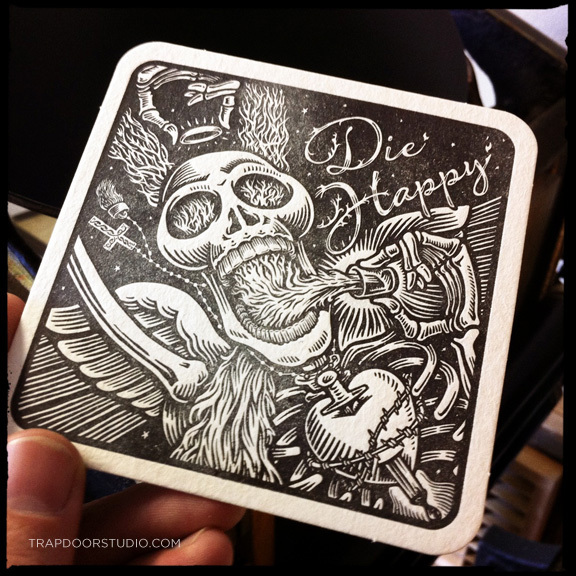 Design and execute a coaster in a 4″x4″ space, 1 color, using the theme “DIE HAPPY”. Straightforward, just the way I like to operate. 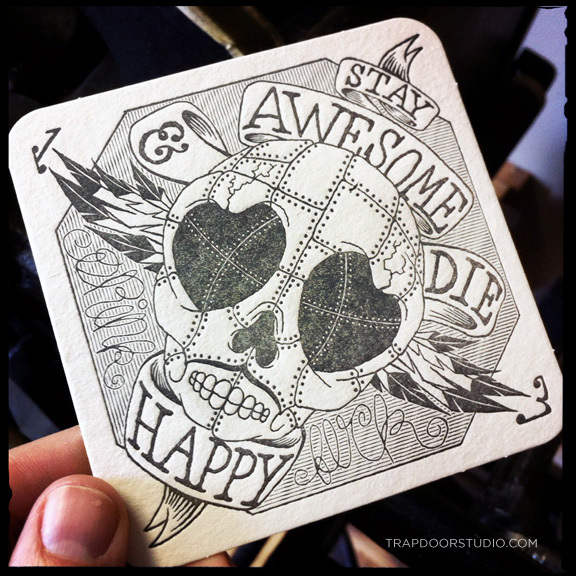 Art by Jon Arvizu, It’s my blog so I get to go first. 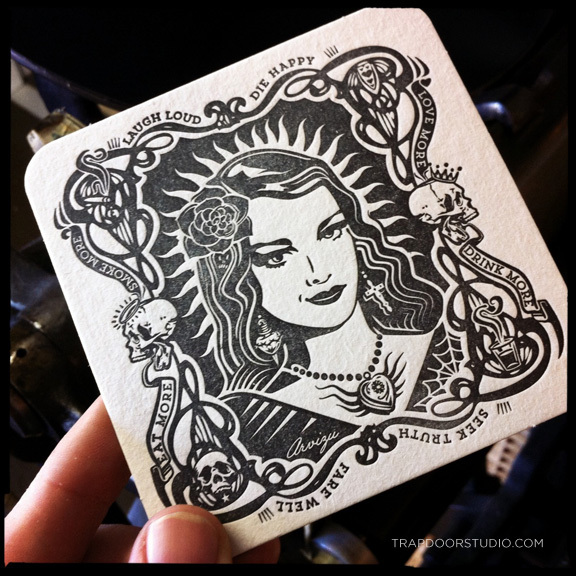 This design is chock full of iconic imagery from an ongoing Dia De Los Muertos series I have been working on. I create new artwork each time but tie the pieces together using consistent symbols such as the locket, flowers, hearts, crosses, crowns and skulls. I enjoyed coming up with statements about indulgences and living life to the fullest. Art by Tim Brennan. Always manages to stay awesome. Art by Kristy Roehrs. Elegant design as usual. Art by Robert Case. We’re all in control of our lives. Throw out religion and superstition – we determine whether our life has been worth living – so drink up (or not) – Live Well & Die Happy. The back of each coaster gets some informational love. Listed are all the players plus some documentation on the series. These designs were printed earlier this year. In true Arvizu fashion, I’m always running around like a madman from one thing to the next, so I am JUST NOW getting them up on the site and available for purchase! I’ve taken the prints to a few craft fairs and most of the first printing of 25 is already gone. 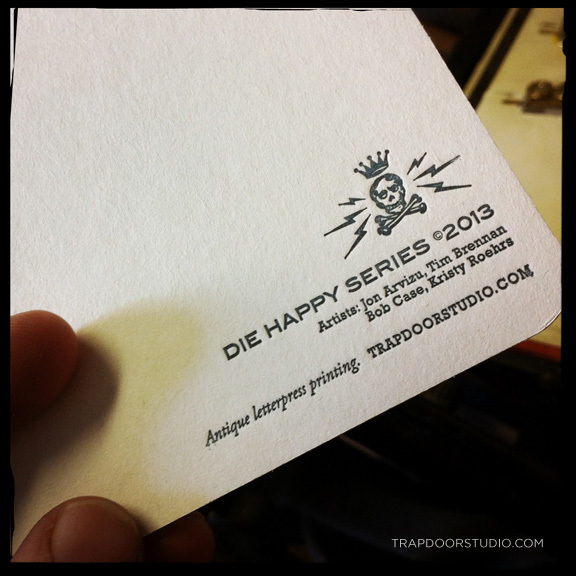 I’ve just run an edition of 50 and they will be available for purchase as of today! It’s a handmade, time consuming process so these may be the last run of this design before it’s retired. 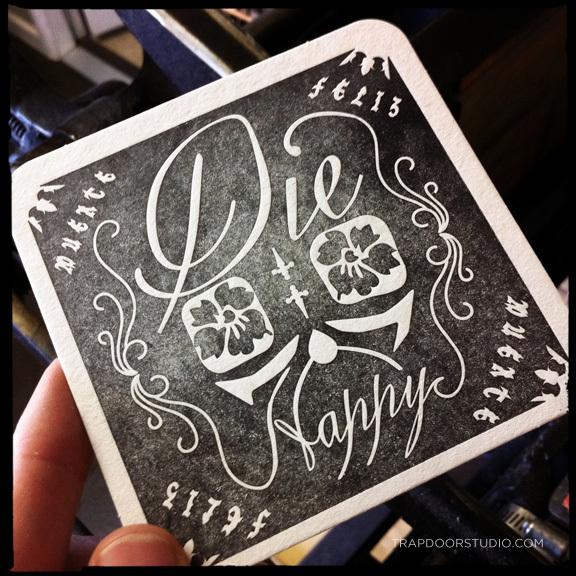 Each set Includes (5) coasters. 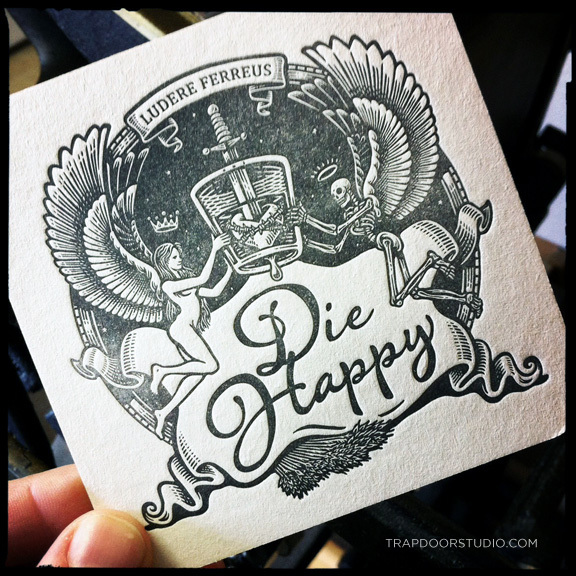 Each design has been lovingly illustrated, then handprinted on my Antique Challenge Gordon Letterpress. Truly unique. As long as you see the (BUY NOW) button above, we still have product in stock. Get ’em while they’re hot!